The 2019 Audi E-Tron is a big deal; it’s Audi’s first fully electric vehicle, and the first of many. But while it was developed as an electric vehicle from the ground up, it unsurprisingly draws from the Volkswagen Audi Group stable—and some more unlikely places. The E-Tron is the first vehicle to ride on the new Audi C-BEV platform. Looking at the chassis, it is obvious that it was designed as a battery electric vehicle from the start as the middle of the body uses the battery as a part of the structure but things become much more familiar once we move to the suspension. The front suspension consists of their common five-link setup which is found on vehicles such as the Audi Q5 and Porsche Macan, with two links up top and three below the axle. Based on the pictures that we have so far, the suspension links and axles look to be located in almost the same exact spots. The the front track width of the E-Tron is also an exact match for that of the Macan and comes in at 65.2 inches. Moving past the suspension, we see that the brakes are also very familiar. The brake pedal is a standard Audi part used on everything from the A4 to the Q5. The brake caliper is a six-piston Brembo unit which is found on certain variants of the Q5 and Q7 and the brake rotor is a two-piece pinned design that is found on a few other Audi vehicles as well as the Ford Mustang GT350. This design is currently only built by SHW and it employs an aluminum hat that is pinned to an iron disc in order to save weight. The E-Tron employs a 15.7 inch variant of the rotor which is a match in size for the one used on the Audi S6 and about a quarter inch bigger than the variant used on the GT350. Thus, the E-Tron should have no trouble coming to a quick stop especially since it gets to combine these massive discs and calipers with regenerative braking. 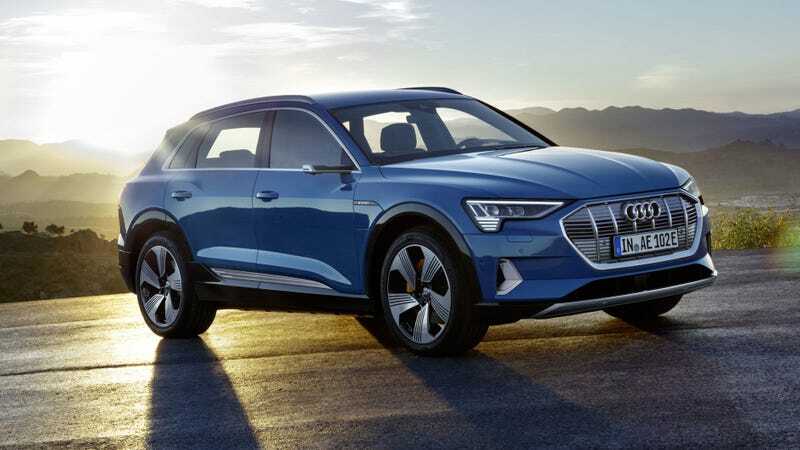 The steering ratio for the E-Tron, is listed as 15.9:1 which deviated from the 15.8:1 ratio on most of Audi’s SUVs, but makes it a match for the ratio used in passenger cars such as the A4 and A5. That way, it should offer a more car-like steering experience. Shared parts are no surprise here, or at other car companies. They are a benefit to the Volkswagen Group from the manufacturing front as they will allow them to save some money due to the commonality with vehicles that they already have in production. There are likely a bunch more parts that were pulled from other VAG vehicles and I’ll be tracking them down as more details surface. I also haven’t been able to find a good picture of the rear suspension, so I am unable to tell exactly which car it pulls those parts from or how they modified the rear subframe for the electric motor. But based on what has been revealed so far, the driving experience for the E-Tron looks promising as the specs lead to something that should drive like a slightly heavier Macan with instant torque.